During a clause-by-clause consideration of Bill C-51 that ran late into Tuesday evening, the public safety and national security committee voted down all the amendments proposed by the NDP, Liberals and Green Party. The bill on the whole was passed in committee with Conservatives and Liberals voting in favour, and the NDP against. NDP public safety critic Randall Garrison said the Conservatives used their majority on the committee to block any changes. “I’m frustrated on behalf of Canadians because 45 out of 49 witnesses called for significant changes of the bill and we didn’t get any,” Garrison tells Yahoo Canada News on Wednesday. 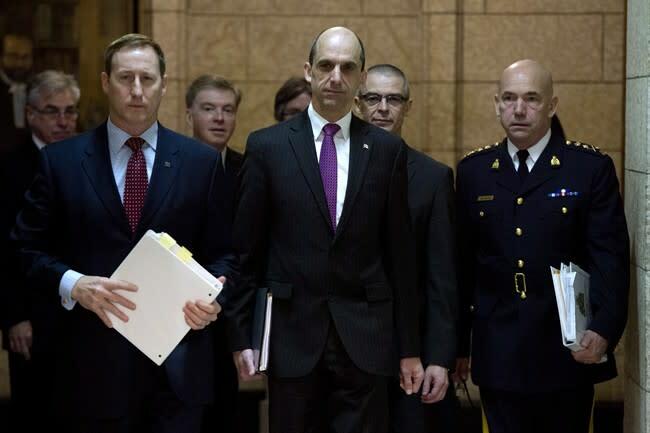 The committee began studying C-51 near the beginning of March and sat through, what may have seemed like to some, a lightning speed round of witness testimony. MPs adopted three minor amendments — the ones tabled by the Conservatives and leaked late last week. The government amendments included changes to the “lawful protest” aspect of the bill, which clarifies CSIS does not have law enforcement powers and puts limitations on Canada’s public safety minister’s ability to direct airlines in efforts to prevent terrorist activities. When Green leader Elizabeth May unveiled her party’s 60 amendments to C-51 earlier this week, she said the government wasn’t turning its ear to witnesses at committee, but rather listening to polls and public dissatisfaction and distrust of the bill. Michael Geist, a professor at the University of Ottawa and well known commentator on Internet and privacy issues, crunched some numbers and provided a tally of witness appearances at the committee. He noted that of the 49 witnesses, only eight were in support of the bill. “One of the most striking aspects of the hearings was how difficult it was for the government to find expert supporters of the bill,” Geist writes in his blog. Randall Garrison noted that the NDP tried to sub-amend the government’s amendments — for example, by trying to state clearly in the bill that CSIS would not have detention or rendition powers — but that these were summarily dismissed. Bill C-51 will be heading back to the House of Commons for report stage, where the NDP plans to try and delete some provisions they find troubling.